A 6-kW solar array caps the open bridge. 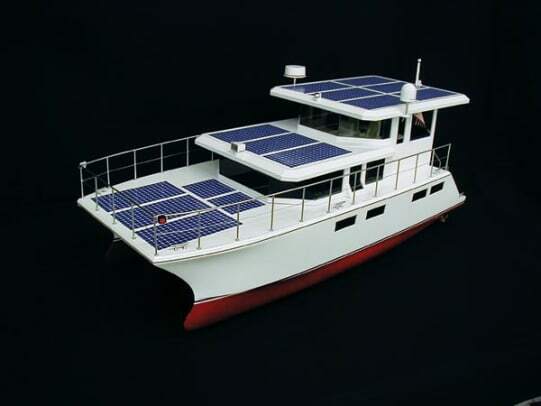 Though her slippery hull form is an important component, the real break-through is the diesel-solar-electric power system. 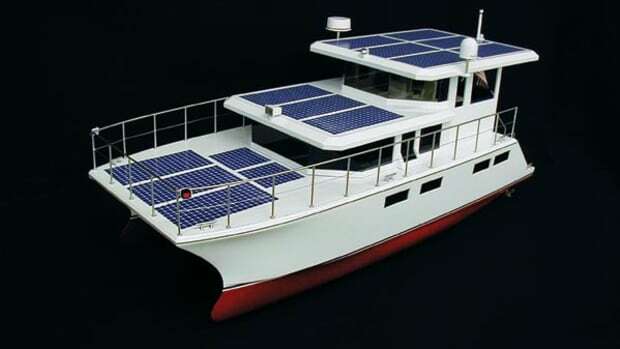 Virtually all of the flat surfaces of her foredeck, deckhouse, and pilothouse roof are covered with photovoltaic solar cells coupled in two parallel arrays rated at 280 volts and 3 kW each. Energy from this array is stored in two banks of AGM deep-cycle batteries stowed beneath the cabin sole in each hull. Her battery capacity will allow for up to two hours of running with no input from the solar panels. 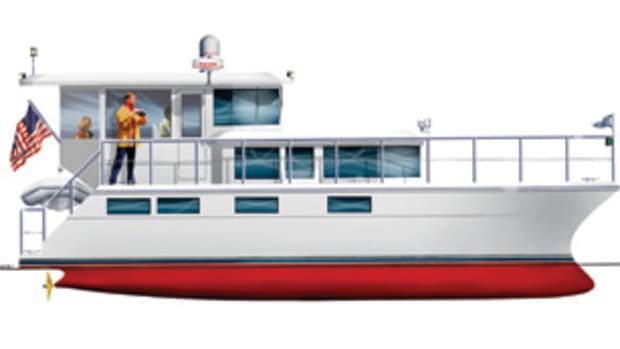 For longer cruising range and/or higher speeds, there’s a 25-kW diesel genset (in a hushbox) tucked into the bow of each hull. It’s powered by the same three-cylinder Mercedes diesel engine that’s used throughout Europe to power the ultra-efficient Smart car, boasting an electronically controlled common-rail fuel-injection system. 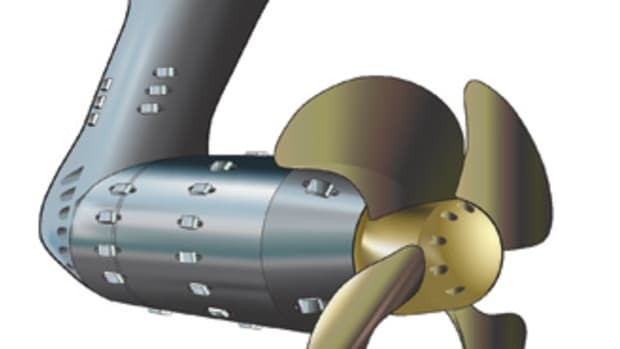 Genset output is 240 volts D.C. to match the 240-volt, 25-kW motor in the stern of each hull. The beauty of the system is its simplicity of operation from the operator’s perspective; at low speeds the DSe will cruise silently on battery and/or solar power, but when energy demand increases, the gensets will start automatically. And with the gensets in soundshields, there won’t even be an audible increase in sound. Running the DSe should be about as quiet as driving a golf cart. Accommodating large solar arrays constrained the design so as to provide flat horizontal surfaces that would be as free from shadows as possible. 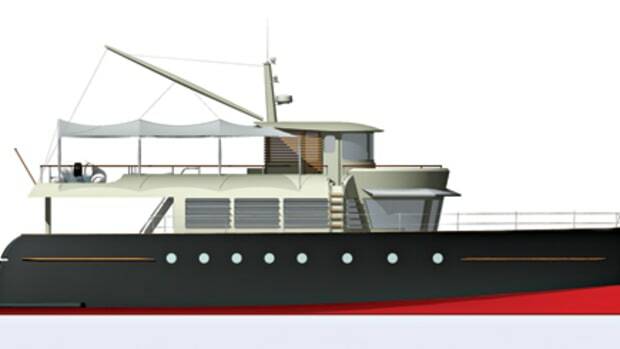 This requirement influenced the styling of the DSe, resulting in her flat foredeck and flat rectangular tops on her deckhouse and pilothouse. 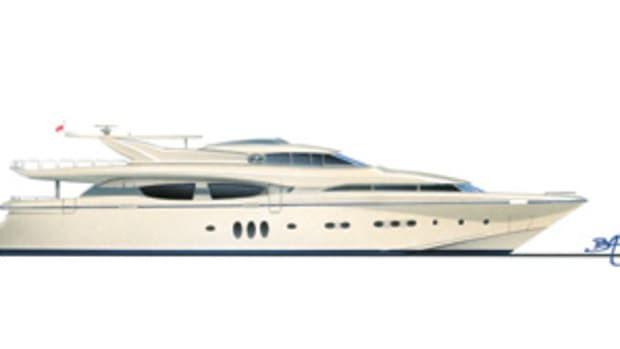 Building on that theme, the design team developed a profile punctuated by big rectangular windows that wrap around in front, a style often seen on the deckhouse of megayachts. Openings aft in the pilothouse are covered with Isinglass, so the bridge can be open to the air or closed to offer climate-controlled comfort. Jutting aft from the pilothouse is a “rumble seat” that increases space on the bridge deck, while providing a support from which to suspend a tender between the two hulls. 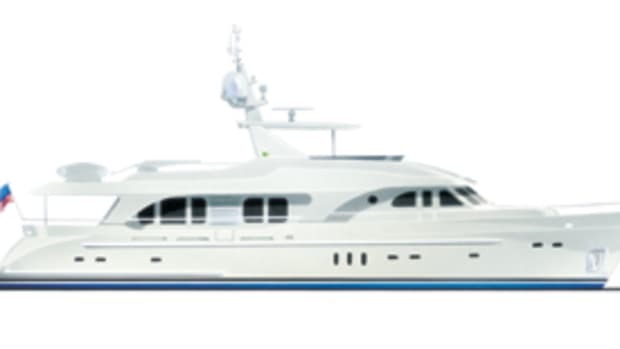 The hard edges of her superstructure are softened a bit by a gently swept bow and by a reverse-angled transom with molded-in steps to swim platforms on each hull. Creature comforts on the DSe complement her cutting-edge technology. 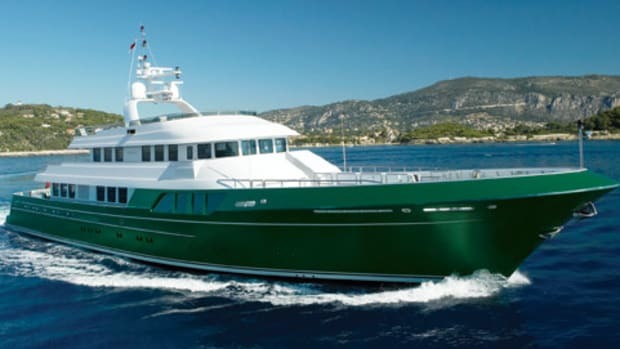 For starters, her pilothouse offers twin helm seats on pedestals to either side of a movable centerline console. To drive from a standing position, the console will slide forward so the captain can stand on centerline. With the console in its aft position, it can be rotated left or right, so either of the two helm seats can be the captain’s chair. A joystick and all instruments are integrated into the single fly-by-wire console. The lower deck boasts two equal staterooms.